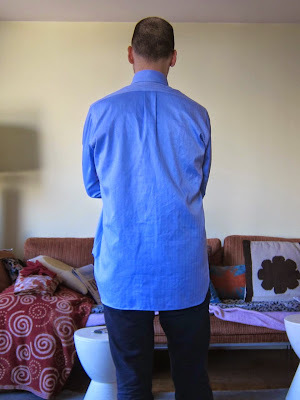 male pattern boldness: Completed Preppy Shirt REVEAL! I finished my herringbone cotton shirt today and I love it. 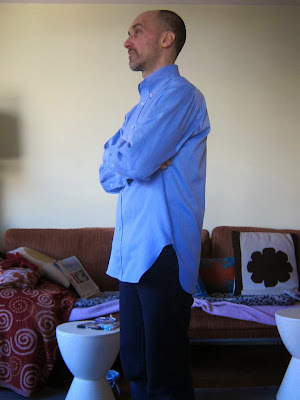 Just to review, I made this shirt using Butterick 6319 (below), a mid-Fifties men's dress shirt pattern I found on eBay. My beautiful cotton shirting was sent to me by MPB reader Josh a few years ago. Initially I thought this fabric was too heavy, but I adore it now. The color is also perfect. My favorite elements of this pattern are the shaped hems and the long collar -- 3 1/2" from top edge to point, in case you're wondering. 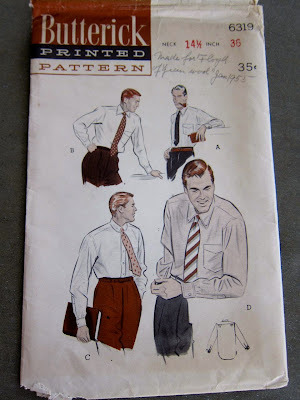 This was approximately the collar length of most Oxford cloth button down shirts made during the height of Ivy style (arguably the mid-Fifties through the early Seventies). While Ivy style is hot again, most Oxford cloth button down shirts have considerably shorter collars. Surprisingly, I also love the roomy fit -- so different from the shirts I usually make. 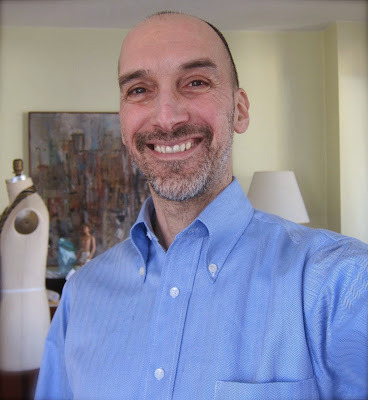 Here's what an actual classic-fit Brooks Brothers shirt looks like on me (below): considerably fuller than mine. 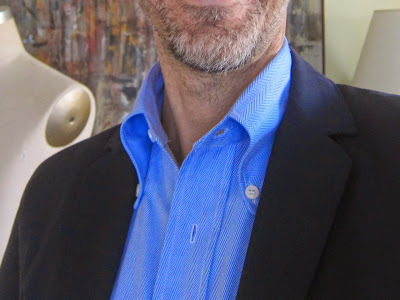 I made my shirt on my Kenmore 158.141 zigzagger, using a straight stitch foot borrowed from my Singer 15-91, and with a straight-stitch needle plate. I made the buttonholes with the aid with my vintage Singer buttonhole attachment. 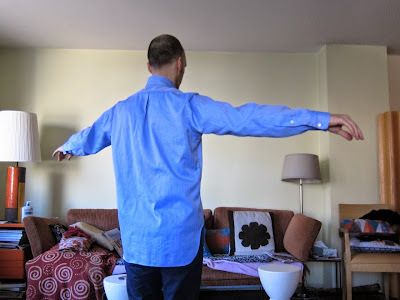 The only adjustments I made to the pattern were to shorten sleeves and torso 2", and to put my flat-felled seams on the inside, rather than the outside of the garment. I toyed with the idea of French cuffs (included with the pattern), but the folded layers, which I'd already interfaced, felt too thick, so I opted for standard cuffs. As I mentioned in my previous post, I changed the gathers in the back to a center pleat (below). 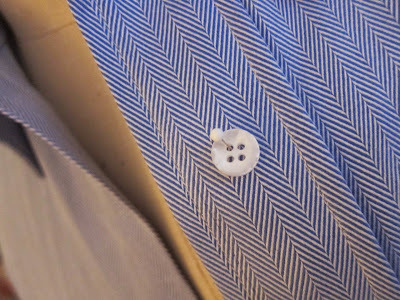 My buttons are simple white plastic shirt buttons from Steinauf & Stoller. 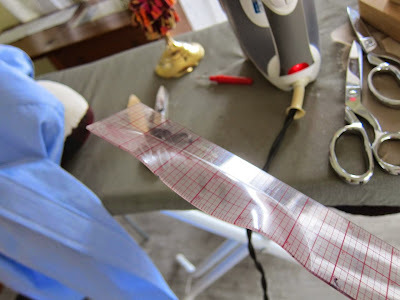 Somehow in the course of making this shirt, I melted one of my rulers with my iron. How did I manage to avoid this up until now? You may not realize that there's an online community of Ivy-look aficionados who obsess over the fit and quality of their Oxford cloth button down shirts. You can witness the compulsion here, here, and here. I'm such a fan of that collar. It's a fabulous shirt. Beautiful Peter, as always. What is next? 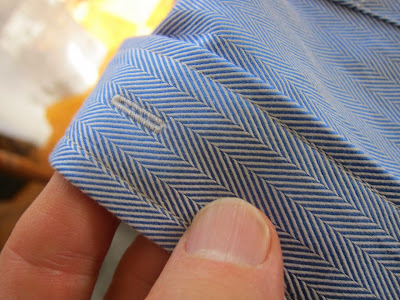 OCBD= obsessive compulsive broadcloth disorder. Wow. That's beautiful. I love it on you. You look so ivy league, especially with the navy jacket. Great job on the shirt!! Gorgeous shirt. That big collar can accommodate those big vintage ties -- you're ready for glee club. 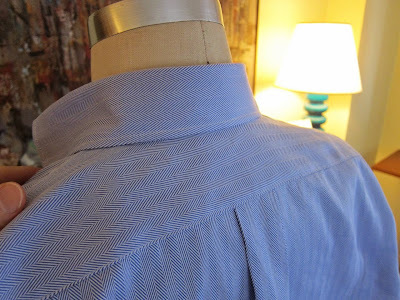 Will your next suit project dovetail this shirt? I hope so. Best shirt ever! And I've melted 2 of my see-thru rulers with my iron. Just cut off the melted part and go your merry way! I love the larger collar. An absolutely beautiful shirt. 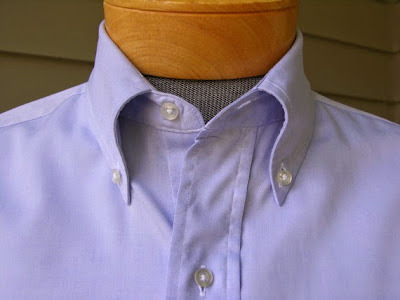 The 31/2 inch collar is the way a button down should be, the smaller collars look skimpy. What a generous friend to gift you with the fabric. which machine you use. Let's people know you don't need high tech machinery to produce fantastic results. Beautiful shirt, Peter! Well done. Perfect fabric, wonderful pattern execution, bravo. Beautiful shirt and I love the fabric. I like the roomier fit on you too. Talk about a bargain (obviously you already thanked Josh). That looks like a very high end shirt!!!! You look fantastic! You look like you should be a professor at Harvard or Yale! I'm curious about your vintage singer buttonholes, I've recently got a vintage singer and the button hole attachment looks like a method of torture and I'm not really sure how to use it! Nice shirt, awesome fabric. It look s good on you, especially with the jacket! Beautiful as usual. That fabric looks terrific. 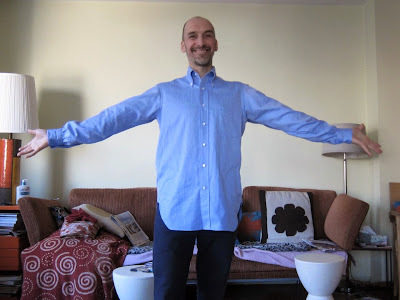 It's really difficult to find heavier weight shirtings. Unfortunate, because they feel great on. I'm sure you'll be wearing this a lot. 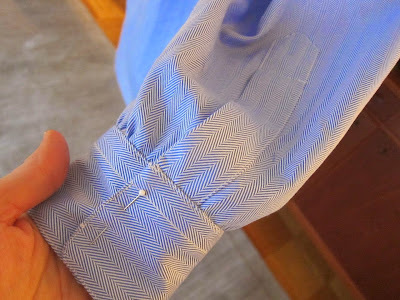 Gorgeous shirt, Peter, and such beautiful workmanship! 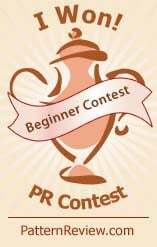 as a great resource for all things "trad". The forums are great, too. That color looks wonderful on you, and your buttonholes are so good, I initially thought you had them done at Jonathan's! I thought the same thing about the buttonholes. Another great garment from your skilled hands! That fabric turned out to be just right for that pattern. That is one expensive looking shirt! This is beautiful! I love it so much! Wow! I wish I could make a shirt that looked that good. 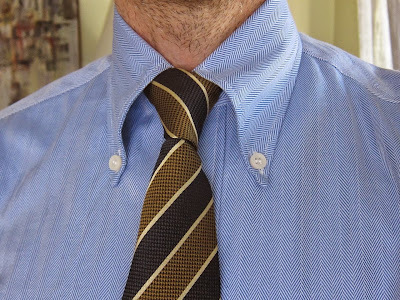 Beautiful collar on that shirt, I'm always inspired by your skill with this stuff. Congrats on all the right preppy instincts, Peter. French cuffs or a gathered back would have completely spoiled the BB vibe, so well captured by the collar and hems on you pattern. When I went off to prep school in the 60s, my first weekend-off field trip was to Brooks in Boston for an oxford cloth button down shirt almost exactly like yours. And that same shirt was the eventual inspiration for my interest in making my own shirts. You've brought it all back to me with all your splendid choices and workmanship here; thanks! Your shirt is simply beautiful and has inspired me to make one for my husband. This shirt looks great on you. I zoomed in on all the pictures to admire your workmanship - the construction is impressive. As always, you inspire me to develop my own skills further. Your shirt is just fantastic. Beautiful! Your shirt looks great. The color looks good on you as well. Thanks for also sharing what machines you used. It is also nice that it is not 'form fitting' with some ease for comfort. It looks like it will be focal point for your wardrobe. I love your fabric, collar, and the fit of your shirt. You look like you must smell and feel just like my high school boyfriend...which was great. 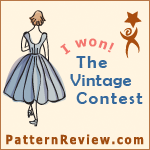 Beautiful sewing and design choices. Congrats. Your shirt is so elegant. I love the collar too! Sweet. I'm just about to finish my shirt (a project that I took on having never used a sewing machine before!!). I've just done the button holes and am about to put the final buttons on and then it's done. ~2 weeks on and off. Thanks for sharing your stuff. It's helped me immensely. I'll post a piccy at some point (once I wash the chalk marks out!! ).